Early this year (2001) we had decided to spend the week around June 6 in Normandy. Come June 3, our departure date, it turned out that only four of us could actually make it. Well, that's tough on the guys who had to stay behind. Hope you'll be there next time, buddies. On the bright side the jeep was running fine, the 10-in-1 ration all done up and ready, Derk had arranged for housing and Cor, Tim, Pieter and I, we were all rearing to go. Some people seem to think that stopping for gas is an adventure that you just have to put in your report. Well, they are darn right. Our departure date June 3 being Pentecost, a European holiday, and a Sunday to boost, finding a gas station in France that is not closed up and utterly abandoned can be quite a thrill. All the more since our Land Rover was nigh on running on empty. We ended up having to double back 28 kilometers to just make it to an lone automated gas pump in Amiens. And this only worked with a special 'reserved for the French locals and definitely not for dumb foreigners' type of credit card only. So we twisted another 4x4 driver's arm to pump 300 francs worth for us on his card while we paid him cash. He looked somewhat bewildered and I am sure didn't know what had hit him but bless his kind heart I say. There must have been however a higher plan from the Creator of the Universe, to make us stop for gas. You see each time we stopped, for whatever reason, we routinely checked to see Eugene the Jeep was still properly strapped on that trailer we were towing him on. And when we did just that at that gas station we saw to our horror that the front tie-down strap had been rubbing against the right front leaf spring and was almost sawed in half. Had we had more gas at that point this could have turned out a real bad trip if that strap had given out altogether. But thanks to providence we were able spot and fix the problem in time. We rearranged the straps in such a way they were safe again and they held perfectly the rest of the trip. And carrying on a trailer still beats flogging along a 57 year old jeep at it's own 50 or so mph limit on a modern highway. Without further ado we continued, crossed the Pont de Normandie, and slid into bocage country to arrive safe and sound at our country holiday home. Surely without realizing it our lieutenant in true officers fashion had arranged officers style billets for all of us. It was awful nice but the rent proved a bit steep for us enlisted men. Still, a fine cottage it was. Sure beats the heck out of sleeping in a foxhole anytime and we felt right at home. That first day ended with a meal in Bayeux and cidre and sun in the garden for afters. Another gloriously sunny day. 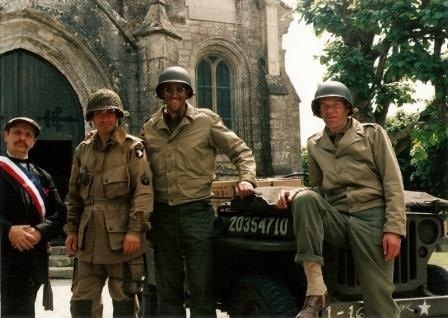 Pieter wasn't to arrive till the next day so we dressed up and armed with a good map braved the bocage roads toward Omaha beach and beyond for some reconnaissance. We had Eugene to carry us in style on this recce trip. After Omaha we decided to check out the Pointe du Hoc, those famous cliffs that were scaled by the U.S. Rangers on June 6, 1944, and where Paul Anka in the 1962 movie The Longest Day spoke the immortal words, 'I wonder what "bitte, bitte" means', after having rudely introduced a hapless German to Mr. Thompson. Here we boldly parked the jeep were no jeep had gone before since well, probably the war I guess; right in the park next to the main path to the monument there. 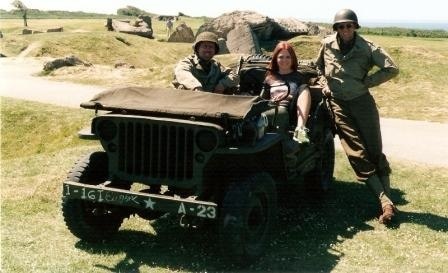 Here we enjoyed the beautiful weather, entertained the visitors, opened some K rations and coaxed the prettiest of a busload of beautiful Texan girls that were visiting, to sit and pose in the jeep. We had the bestest fun mimicking the way they spoke: 'Eh.. we're from like .. Texas? It's all so like .. green out here. Where we're from it's like ... dessert, with like ...no trees and all? Just oil derricks.' They were sweet, it was fun, their bus was leaving, we went home. Three man were sent out in a jeep on a mission. A mission to find a paratrooper named Mike "Mitch" Pascal. We had to deliver a parcel to him in an 'Overseas Shipper' box. 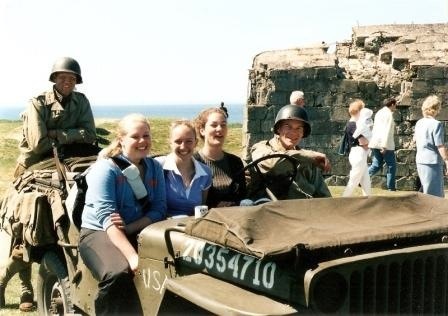 All we knew was that he was around Utah beach somewhere that week. We started by trailering Eugene to Ste. 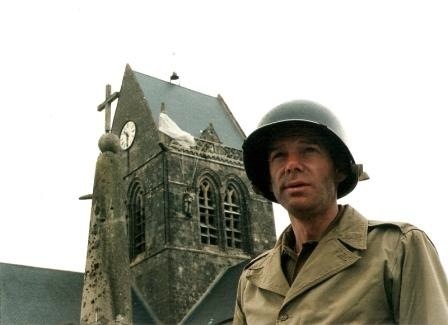 Mère Église, jazzed him up with gear, donned helmets and battle dirt make-up and set off for Utah beach. There huge tents were being erected for the premiere of Spielberg's new project called Band of Brothers. While Lucky guarded the jeep Tim and I checked out the beach which was totally deserted. Walking back we ran into the daughter of a Navy radio operator. Dad would love to see us guys in uniform and he was right there in the Roosevelt restaurant with his buddies of old having a good time already. Once inside we were welcomed by Mrs. Chagnon, mom of the lady we had met and wife of Roger Chagnon, erstwhile Navy radio operator at Utah Beach from June till October 1944. During his previous visit in 1994 he had discovered that the bunker used as storage room by the Roosevelt was his old radio shack. And his name with those of his buddies were still where they wrote them on the walls in 1944. The bunker has since been turned into a little museum, more or less restored to its 'radio days' and we got a special tour by Mrs. Chagnon. Later she came over to check out the jeep and Alain Batens who was also visiting Utah took a good picture of all three 'Dutch Texans' and Mrs. Chagnon in the jeep. Then it was good byes and on with our mission to find Mitch. Succeed or fail we had to be on the church square of Ste. Mère Église by three to meet up with Pieter. We went there by way of Ste. Marie Du Mont, where 101st Airborne troopers assembled after they had landed all around in 1944. We parked in front of the church wondering how to find Mike Pascal when lo presto; there he was, driving up with a friend. This friend Titus was dressed as 'the mayor of the village', tricolored sash and all. He played his part well. All the while our roving eyes had spotted a gorgeous blonde lady who turned out to be part of a camera team from Regent University, Virginia doing a documentary on D-Day. When asked to cooperate we of course agreed. After a somewhat awkward interview (we were the awkward part) we had to pack up to be in Ste. Mère Église by three. Parked once again on the church square we attracted a lot of attention from passers by. Pictures were taken, questions asked and answered and by the time I looked at my watch it was two minutes of three. I looked up and there Pieter turned into the square, 'sharp as ever'. I betcha he had been waiting just around the corner for some time, just to live up to his reputation for being punctual. We met a group of Belgian 1st Division re-enactors who looked very much the part. Only drawback was they don't speak any English but a very nice and dedicated bunch they were too. And a few "current issue" All American paratroopers showed a lot of interest in us portraying basically part of their history. We gave them some rations that we had made up and they gave us dog tags and first aid stuff. We all enjoyed the exchange very much. Then once again we headed for home. This time with the four of us. The next day we would rise at four. Yes, we do this for like ...fun? Oh Lord, can you see, by the dawn's early light,... no, we could not see much. Neither the fun, nor the early light itself as it was dark and a downpour looked imminent, leaving us deliberating desperately will we go or will we not go in a jeep fully packed with the top down to the invasion beaches. Finally, as general Eisenhower had to, 57 years earlier, we decided it was on. Be it with a little adaptation. We would go and check out Omaha and the weather with the Land Rover. There is no point in getting 60 year old gear soaked if you don't have to, no matter how noble your motives. It was dry and very quiet 0632 hours on Omaha Beach. The sun was up by now but very few people. Those who were there seemed all to appreciate our modest tribute. Walking that beach, knowing what went down there 57 years ago leaves you very much with your own thoughts. We walked back, piled into the Land Rover and went to pick up Eugene the Jeep. The previous day I had 'roughed up' my 10-in-1 to make it look like it had been in ships holds, on trucks, handled by many greasy hands, etc. In all modesty; this being the third 10-in-1 I have made so far, they are getting better all the time. 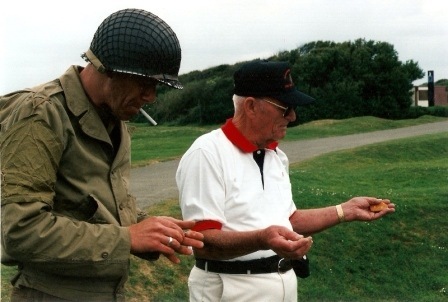 The plan was to open a 'First' and 'Second Half' at the Pointe du Hoc. So we tied that ration box on the hood, hung our gear on the sides and rear of the jeep and set out again for the beaches. When passing through St. Laurent sur Mer I suggested we take the road to the beach to continue along the seaboard all the way to Vierville. Near the monument for the 2nd Division we ran into Mr. Roger Lucas who landed at Dog Red in June '44. 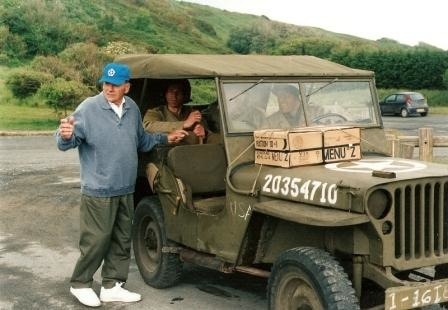 He was here with his family and we gave him and two of his grandchildren a little ride in the jeep. He had been in jeeps before and seemed to very much enjoy it. We then continued on to the Pointe du Hoc. Having gotten away with it once we again parked the jeep on the same spot and started our 'act'. An Army Airforce vet came over. Only half an hour before the Rangers were to begin their assault he was still over the Pointe in his B-24 bombing the bejesus out of it, he told us. Referring to our ration he said with a smile that he had to live on 'that junk' for months. Nice compliment that told us it looked real enough. Other people too were very much interested and more vets came over to talk. This was what we had come out for. Then a guy named Bill, I forgot his last name, a 1st Inf. Div. 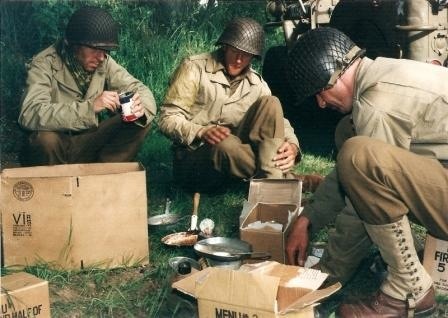 vet, came up to us as he too recognized those rations and our uniforms. He had landed on Omaha, June 6th, 1944. His family persuaded him to come back after all these years and he said he was holding up pretty well, better than he had expected he would. Then another vet walked up, they recognized that 'You were there too, right?' look in each others eyes. Yes, he was. What followed was a big hug, tears, and Bill said to the other vet, 'It was a tough day, wasn't it buddy.' It sure must have been, like so many other days must have been, to so many people. It impressed us a lot and sort of shut us up with our modern day itty bitty gripes and gripettes. Crash landing us back into the 21st century was a pea brained French park warden (picture French actor Louis de Funes) who almost exploded when trying to point out that we could not possibly park a vehicle there and start a picnic. Well, hello, hello, monsieur. Can't you see you are the only one who is not enjoying or appreciating what we are trying to do here? And ever considered asking anything nicely? A kind French visitor put up a brave defense for us but no, we had to leave that very instant. Well, no reason to start a war, we wanted no trouble on this special day. We had been there for a while, we had done our thing, taken our pictures so we decided we had made our point, we packed up and left. On the way back we visited the Belgian Big Red One camp at Vierville. They had put up a 1942 pyramidal tent. You don't see those too often. They offered us a beer, we admired the pictures of their efforts and moved on. There was a temporary exhibition at the Colleville town hall on the 1st Division landings, we wanted to see. After that we found a quiet bocage lane to have dinner, then we went home. The next day we wanted to shoot some pictures close to home. We took the jeep to the next village, picked a nice looking court yard with a friendly dog and asked if it was o.k. to park the jeep there. But of course monsieur. It always happens; Of course you can park, make yourselves right at home. But wouldn't you boys want to come inside for a drink? Why, sure. That's mighty nice of you ma'am. So there we were enjoying a glass of home made cidre just when it really started to pour with rain. Not only did we get stories of the region during world war 2 and cookies but when the rain stopped and we moved on we also received a bottle of 1987! vintage Calvados (yes, for once this is a French word pronounced exactly as it's written, with the s on the end. We asked to make sure). The next day we'd go back home. Whaddayasay boys, we'll hit them beaches agin next year, or what?